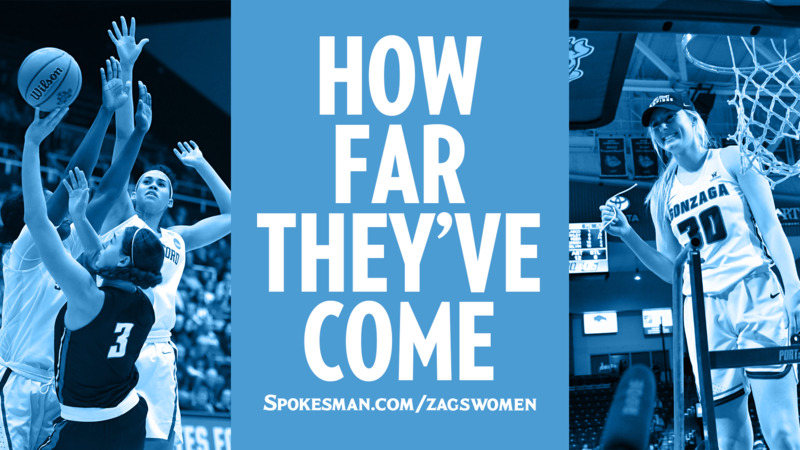 It really is about the journey – and the potholes, even on the victory tour that was this year’s Gonzaga women’s basketball season. It began almost 12 months ago in a sullen locker room on the campus of Stanford University, where the Zags had just lost their first-round NCAA Tournament game to the host Cardinal. Defeat meant the end of another standout season: 27 wins, just six losses and trophies for winning the West Coast Conference regular-season and tournament titles. It was also time to say goodbye to seniors Emma Stach and Emma Wolfram and take a few weeks off before off-season conditioning – an oxymoron because the college basketball season never really ends. “Now we just have to keep getting better, pushing in the offseason,” Wirth said. Five days after the season ended, leading scorer and rebounder Jill Barta announced that she would forgo her final year at GU. Nothing like hitting a crater-sized pothole before the journey begins. “We have no choice but to move on,” coach Lisa Fortier said. Clearly, Wirth and her teammates would need to push even harder. Spokane, Oct. 1, 2018: To a certain degree, even starters are role players. “And every year, players’ roles change,” senior Chandler Smith said on the opening day of practice at the McCarthey Athletic Center. “By midseason, I plan to fit into my new role,” Smith said. Would she have that much time? There were big holes to fill, especially the go-to player who had up and gone. “Emma (Stach) could guard anyone and Jill could score on anyone,” said Fortier, who expected those holes to be filled by her team’s depth and talent. The rest of the league’s coaches must have felt the same way, because two weeks later the Zags would be picked to repeat as WCC regular-season champs. Las Vegas, Nov. 17: The Zags were 3-0 coming into a nonconference game at UNLV. They’d beaten a trio of Big Sky Conference teams in Montana, Eastern Washington and Idaho State, but this was a chance to step up. It was also a chance for revenge. A two-point loss to UNLV in Spokane the previous year probably cost GU a better NCAA seed. No problem. The Zags’ depth was the difference in a 70-59 win that saw four players in double figures. Vancouver, British Columbia, Nov. 23: A day earlier at the Vancouver Showcase, the Zags dropped their first game of the season, 81-65 to defending NCAA champ Notre Dame. How would they respond the next day against Rutgers of the Big Ten? With grit. GU mustered only 21 points in the first half, its lowest output of the season, as it turned out. But the Zags owned 36 to 26 advantage on the boards, and found their offensive rhythm in the second half of a 57-40 win. Spokane, Dec. 2: Another game, another chance for revenge. This time it was eighth-ranked Stanford, and the Kennel was ready. Stanford had won its previous six games by at least 22 points, but GU jumped on the Cardinal with the 5-for-6 outside shooting of Katie Campbell and dominant effort (36-24) on the boards. “They got one shot and they were done,” Fortier said after her second career win over Stanford legend Tara VanDerveer. The lead, which had reached 17 late in the third quarter, was trimmed to three, but Smith clinched the 79-73 win with a jumper with 10 seconds left. Springfield, Missouri, Dec. 16: This didn’t feel like a trap game. The Zags were 10-1 and ranked 21st going into their nonconference game at 1-6 Missouri State. But an 11-point lead had dwindled to one with less than 2 minutes left before Zykera Rice put the Tigers away with two free throws and a short jumper. Spokane, Jan. 3, 2019: The first game of the New Year saw the Zags reach 13-1 – the best start in program history. It was the perfect occasion for a visit from Saint Mary’s, which handed the Zags their only WCC loss the year before. It almost happened again, as GU’s eight-point halftime lead GU lead shrank to two early in the fourth quarter. It was still a five-point game with less than 3 minutes left, but Smith drained a 3-pointer to end the comeback and give the Zags a 74-62 win. Stockton, Calif., Jan. 31 – The Zags were 19-2 and ranked 15th in the nation, but had stumbled to a slow start against Pacific in the teams’ first meeting in Spokane. It happened again on the road, as a four-point halftime lead was down to three with 7 1/2 minutes left in the fourth quarter. Smith rescued the Zags again with a big 3-pointer, and GU pulled away to win 63-51. “I thought we had good intensity and a lot of passion in this game. We’re going to need that going forward,” Rice said. Spokane, March 2: As always, Senior Day was high with emotion. The stakes were high, too. GU was 26-3 overall and 15-2 in the WCC but needed to beat Loyola Marymount to secure the WCC title. The Zags trailed by five at halftime and led by six with 3 1/2 minutes to play. Laura Stockton led a Zags parade to the foul line and GU won 68-58. “I’m really happy for them, happy for the staff and just glad that we took care of business,” Fortier said. Published: March 8, 2019, 6:48 p.m. Updated: March 8, 2019, 8:18 p.m.